LaserStar’s 1900 Series Industrial Laser Welding Systems are ideal for a wide range of metal joining, complex assembly, automation and repair applications for the industrial marketplace. 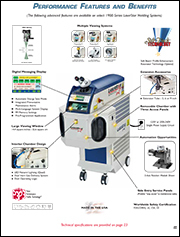 A compact, portable design, coupled with LaserStar’s well-known reputation for high quality, efficient laser sources, make the 1900 Series Industrial Laser Welding Workstation an excellent value. Removable laser welding chambers are designed to be custom configured for the widest range of laser welding applications. High precision motion devices are engineered to integrate into the laser welding system chamber. Five chamber platforms are available: open workspace, open workspace with adjustable shelf, standard, deluxe and automation chamber. LaserStar Industrial Standard Body Laser Welding Workstations are available in 60, 80 and 100 Watt models and integrate a variety of optical viewing systems to meet the specific needs of our customer’s laser welding applications. "We found your visit immensely helpful. Laser welding technology is very new to us and is an essential part of our product development roadmap, so we have found the exercise extremely useful. As you have identified, we are learning about designing weld joints as much about actually making them and this experience is directly applicable to our product design. Looking forward I can only see the need to collaborate more as we develop our knowledge base in this area. Right now we are engaged at a development level but we will need to move to production in due course. This will involve further design development, training and probably additional hardware. In summary I see the need for future collaboration as we explore this and other opportunities."